The city of London in England was founded almost 2,000 years ago as the Roman armies of the Emperor Claudius moved North and West across the islands of Britain. Recently a marvellous discovery was announced. The Romans ha their own integrated transport system in place. It was called Transportum Londinium (TL). The opening of a long abandoned office in the LT building left historians amazed as they found many documents including public notices on how to behave on the new public transit system. Advice to keep their bags with them at all times. Gladii wear to remain sheathed at all times and No stowage of Pilum under the stairs on buses. These are all fascinating insights into the life of Roman London. I have been able to gain access to some of the collection thanks to the help of my friend B.J. Lirpa an archivist at the London Museum. She has allowed me to recreate the design of one of the public notices as a t-shirt. 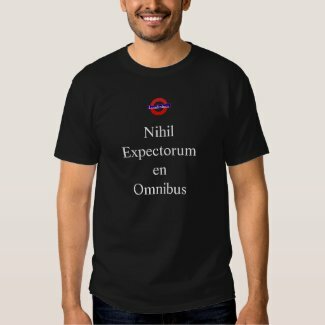 The shirt contains the TL logo while beneath it calls on users to 'Nihil Expectorum en Omnibus', 'translated to 'No Spitting on the Public Transport'.